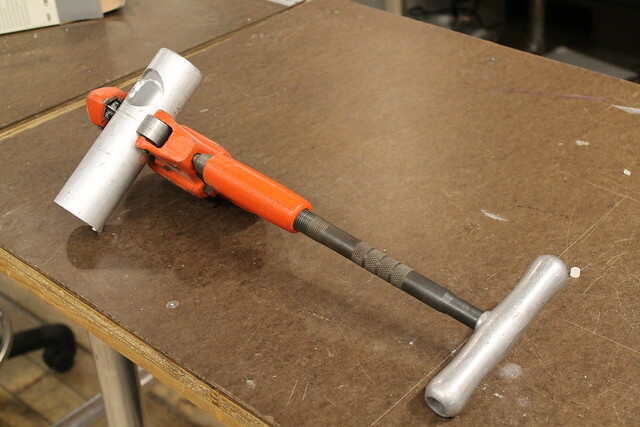 Drilling into a pipe or dowel can be a little tricky. One of the safest and most accurate ways is to use a jig called a V Block and a Center Finder on the drill press. 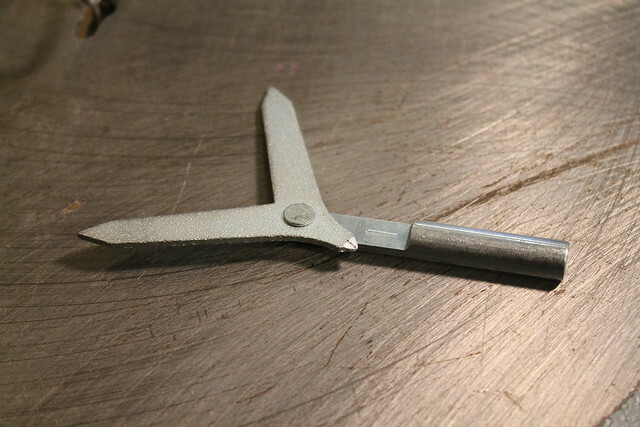 You should never use any tool in the shop that you are unfamiliar with. Please ask shop staff to show you the proper use of any tool and always follow safety guidelines. Most importantly, always where goggles when using power tools. 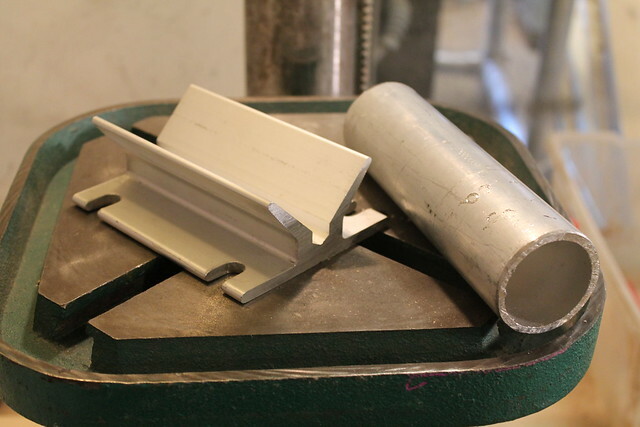 I’m using cast off cuts of speed rail as my material (the aluminum pipe that everyone uses for stands during the ITP shows, this stuff is everywhere). 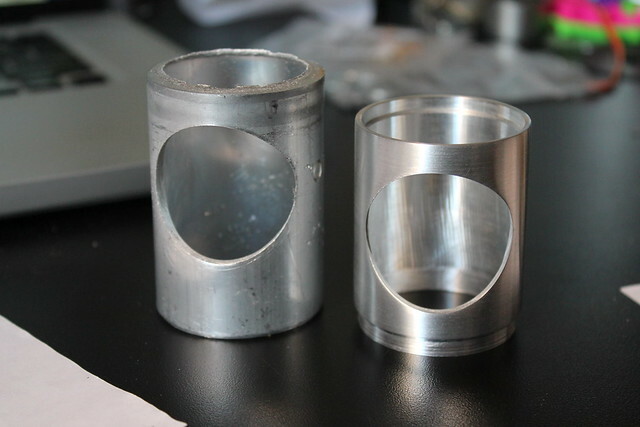 But solid metal cylinders, wooden dowels, or metal or plastic pipes can be used as well. 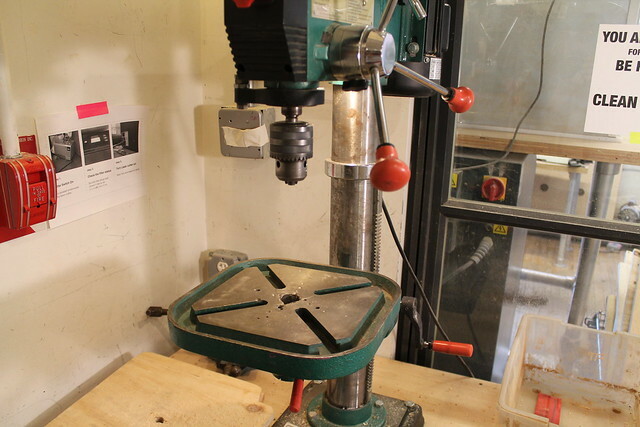 Mount the V Block onto the metal bed of the drill press (you may have to remove the wooden base first). 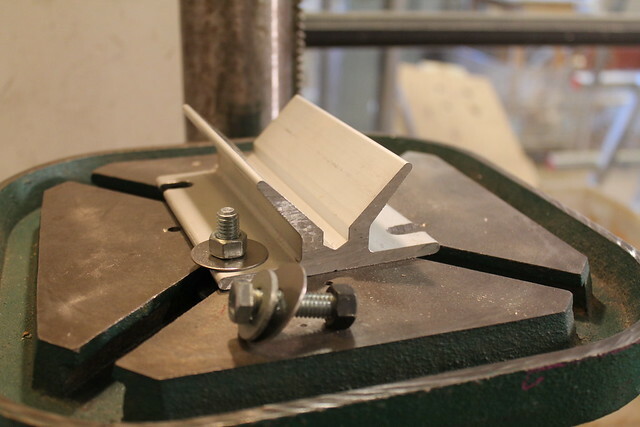 Using bolts and washers that fit in the slots of the drill press bed, loosely tighten the block in place. Place the pipe in the V Block. 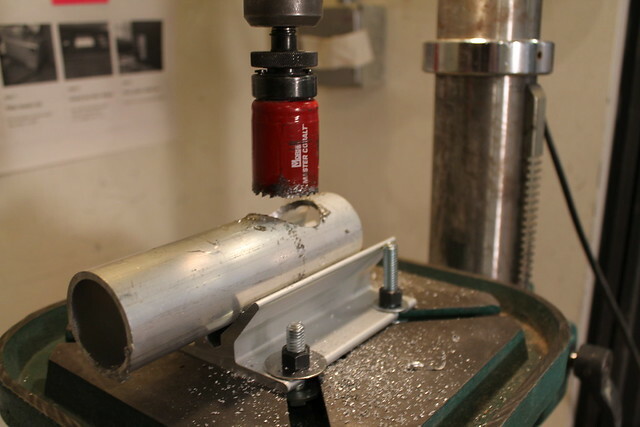 Chuck up the Center Finder in the drill press. Raise the bed to the proper height. 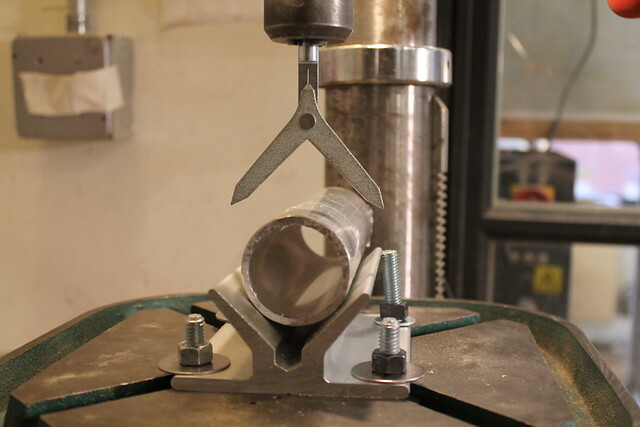 Lower the Center Finder to the pipe and adjust the V Block and/or the drill press bed to align the pointer with the mark on the finder. 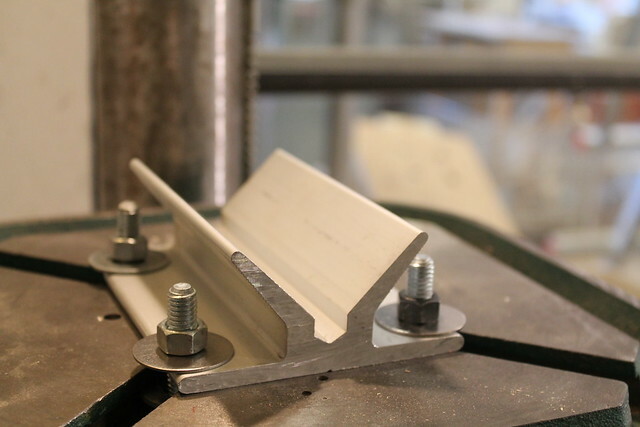 When it lines up, tighten the bolts holding down the V Block and lock the drill press bed in place. Never turn on the drill press while the center finder is in the chuck. Remove the Center Finder and chuck up the drill bit you wish to use. I’m using a 1.5″ diameter hole saw drill bit (found in the white cabinets with the hand drills). But any drill bit capable of cutting metal would do. And remember, whenever drilling metal it is a good idea to use cutting oil. 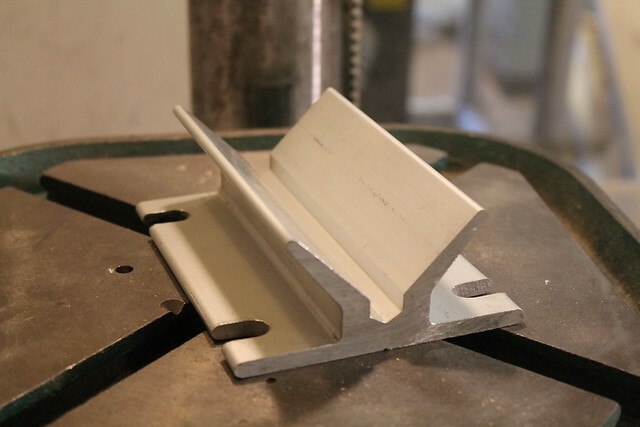 This keeps the metal cool, increases the life of your drill bit, and makes for a better hole. 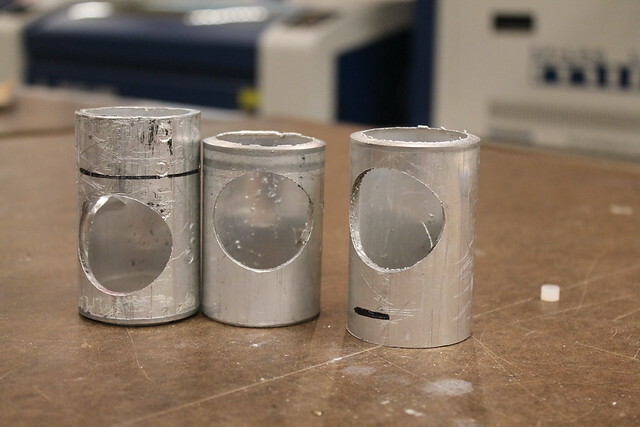 Cutting oil can be found by the metal lathe or in the yellow cabinet. 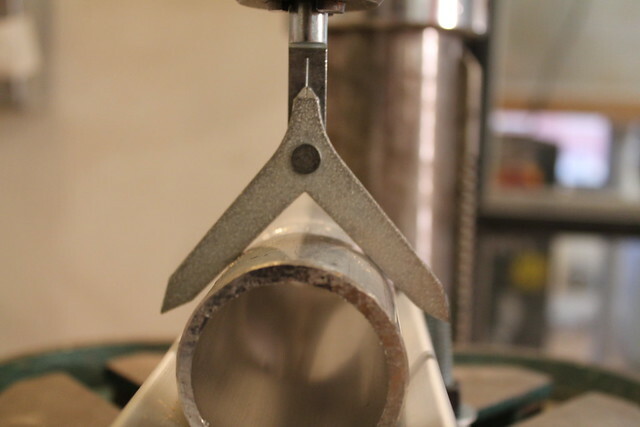 Make sure the drill press is running at the proper speed for the size of the bit you are using. Consult with shop staff if you are unsure. And drill your hole. 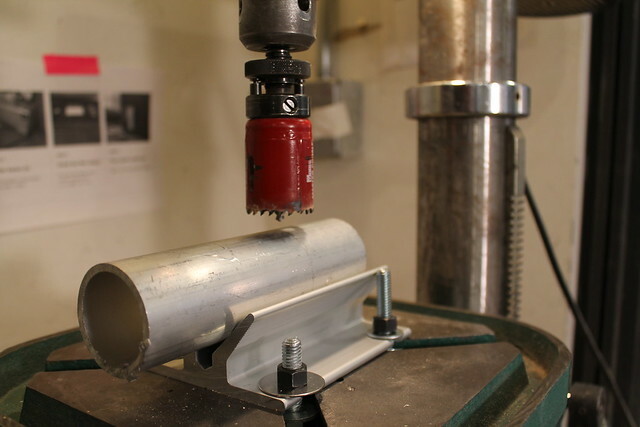 You can drill multiple holes with this set up quickly. 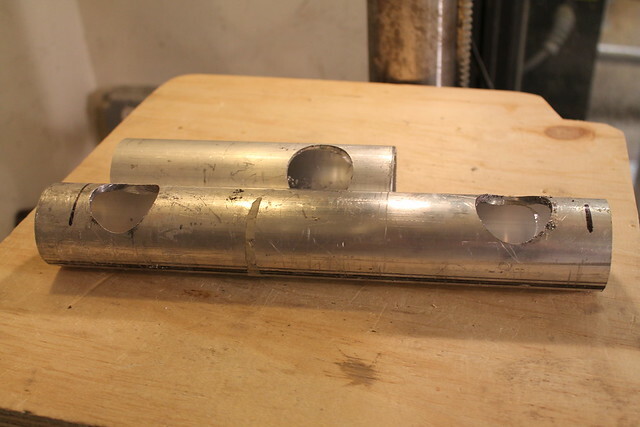 The pipe can be cut to size after the holes have been drilled using a hack saw (found in the red cabinets by the yellow component bins), the metal cutting miter saw (located under the wood cutting miter saw in the shop), or with a pipe cutter (found in the red cabinets as well). I used a pipe cutter. You can sand or file the hole smooth. And the part is ready for any secondary procedures. 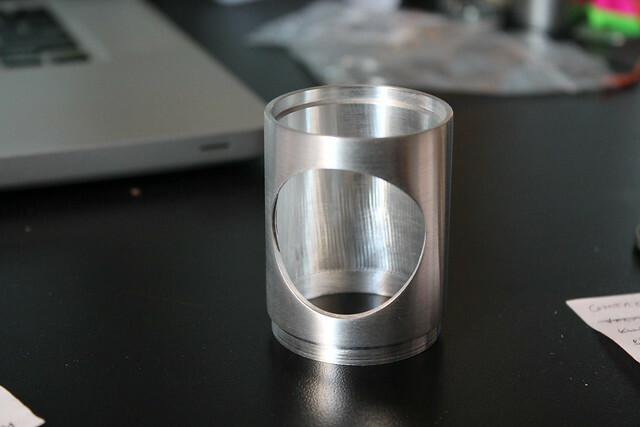 I turned mine down on the metal lathe and polished it.